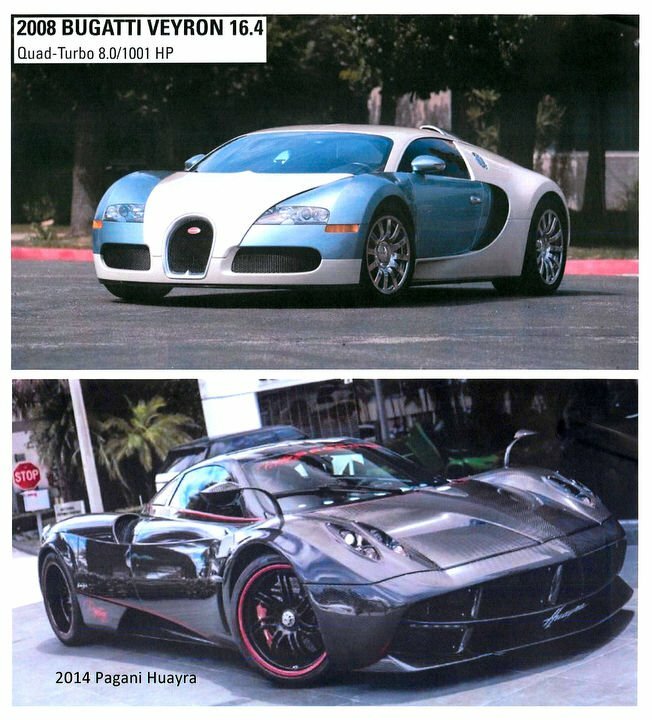 Evidentiary photos of two cars purchased by three defendants who allegedly spent their winnings on diamond and platinum jewelry; expensive watches; an interest in a private jet; lavish properties in Maryland, Texas and Florida; and sports cars. Evidentiary photos of puchases by three defendants who allegedly spent their winnings on diamond and platinum jewelry; expensive watches; an interest in a private jet; lavish properties in Maryland, Texas and Florida; and sports cars. BALTIMORE - Cameron Jezierski was stoic but offered his attorney a brief smile as proceedings wrapped up at the federal courthouse. This wasn't where he'd expected to land. He'd imagined that before he was 30, he'd be a millionaire. At the courthouse, Assistant U.S. Attorney Joyce McDonald described a scheme led by two others - Kevin Merrill of Towson, Maryland, and Jay Ledford of Texas - in promoting "investor confidence that they could entrust their funds to what was really a criminal enterprise." Jezierski admitted in his signed plea agreement to participating in "a scheme and artifice to defraud and to obtain money and property from investors by materially false and fraudulent promises" and that he "knowingly and willfully" worked with other people to do so. The scheme affected investors including doctors, retirees, accountants and current and former professional athletes. Jim Jamison, an attorney representing Ledford in the civil case brought by the Securities and Exchange Commission, described his client as "a very small player" in the alleged fraud. "There was no conspiracy," he said. "Merrill was involved in buying consumer debt, but he has not been for quite some time." The three men are accused in court papers of duping more than 400 investors with "an elaborate web of lies" to give the impression that they were running a successful investment operation profiting from student and consumer debt. In reality, prosecutors say, the men fraudulently diverted investors' money to maintain a criminal operation in which funds were cycled from one investor to the next. Arnoldo Lacayo, a partner at the firm Sequor Law who specializes in financial fraud, said the idea of so-called "fake debt" is a common thread in Ponzi schemes, which leverage a real or perceived economic crisis to lend an air of credibility to an otherwise dubious investment opportunity, he said. "A lot of Ponzi schemes will have some sort of current event that is part of what entices people to get involved," Lacayo said. "We hear all the time about the coming calamity in student loans, about people defaulting on car loans. . . . If you're presented an investment opportunity to get ahead of that trend, it might not sound far-fetched." Prosecutors said Jezierski began working for Ledford as a financial data analyst at Riverwalk Financial in Texas in October 2014. They said Jezierski learned if he submitted financial statements that did not meet certain targets, Ledford would be angry. Jezierski began submitting false information and setting up fake companies, the prosecutor said, to satisfy Ledford and defraud investors. "Jezierski's trend lines based on actual operations were not satisfactory to Ledford because the trend lines did not show sufficiently robust collection results," according to the plea agreement. "Jezierski had to falsify data to create reports that matched Ledford's directions," the plea agreement says. According to text messages cited in court documents, Ledford at one point texted Merrill, "Cameron is working on it too. I have him with the program. He gets it." Ledford allegedly pressed Jezierski to hide his activities, at one point telling him via text message, "Need all of this to be discreet. . . . We do not want anyone to know details," according to the plea agreement. Jezierski responded: "I got your back. No one knows anything nor will they." "Almost 30. I am confident you will reach your goal we discussed," Ledford said in September. Jezierski had hoped to progress even further: "I have your back like always and this is just the beginning," Jezierski told Ledford after receiving a $50,000 bonus, according to the plea agreement. The scheme was uncovered when an undercover FBI agent was offered the opportunity to invest $10 million by Merrill, the Maryland-based defendant, last summer. At a meeting in Dallas involving all three defendants, Jezierski offered the undercover FBI agent financial documents about the business that the plea agreement notes were "fraudulent." Prosecutors say the criminal activity did not end when the three men were charged. Using coded phone calls and handwritten notes held up to the glass wall separating prisoners and visitors where he was held, Merrill told his wife to retrieve wads of cash from their white-gated waterfront mansion in Naples, Florida, which the two referred to as "the restaurant," according to documents. Jezierski's sentencing is Aug. 12, a month after Merrill and Ledford are scheduled to stand trial.